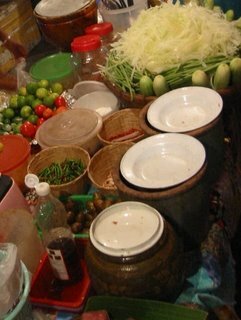 Green papaya salad is the most popular dish among women in Thailand according to a survey I heard on TV there. It is a Northeastern food that is eaten with sticky rice. 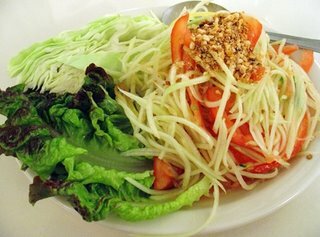 Your favorite vegetarian Thai food are Som Tam. This menu for vegetarian and most famous of Thailand, it’s easy for cooking and delicious. And then use in period Kin Jay festival. That is good idea for Vegan. 1. Prepare the ingredients as indicated. Make tamarind juice by starting with 1 Tbs. of compressed tamarind in 1/3 cup of warm water. Work the tamarind with your fingers to dissolve the soft fruit; gather up remaining undissolvable pulp, squeeze to extract juice and discard. Add more tamarind or water as necessary to make 1/4 cup of concentrate. 2. Divide the ingredients into two batches and make each batch as follows. Using a large clay mortar with a wooden pestle, pound the garlic and chilies to a paste. Add the long beans and pound to bruise. Follow with the green papaya and carrot. Stir well with a spoon and pound to bruise the vegetables so that they absorb the heat and flavor of the chilies and garlic. 3. Add the tamarind and lime juice, soy sauce and palm sugar. Stir and pound a bit more to blend the vegetables with the flavorings and seasonings. Taste and adjust flavors to the desired hot-sour-sweet-and-salty combination. Then add the tomato pieces, stir and bruise lightly to blend in with the rest of the salad. Transfer to a serving plate and sprinkle with peanuts. Enjoy eating your cooking for Som Tam Thai vegetarian food.